Guest panelists include Christopher Nicolson from Red Hook Winery, Molly Culver from BKLYN Farmyards, Jeff Hutchinson and Christopher Munsey. This discussion will be an active dialogue between guests and panelists about what makes the local terroir or geography unique and how this is reflected in local craft, why it’s important to support your local business, how we define “local” and what it means in relation to food justice. While artisanal food in New York is undergoing a renaissance, a lot of the focus is on what’s hot and what’s not. 61 Local wants to cut through the hype and focus simply on what tastes good. They will celebrate the magic of cacao with a tasting of six local chocolates. Come meet the producers who make it, learn how they make it, and figure out who makes it the way you like it. Participating in the event will be Mast Brothers, Jacques Torres, Cacao Prieto, JoMart, Raaka, and Fine & Raw. Each of these excellent chocolate makers and chocolatiers will be in attendance to teach you about their chocolate’s production process and what makes it unique. Chocolate makers and they chocolate expert will be available in the bar after the ticketed event ends at 9 p.m. to offer samples and talk chocolate with anyone who was unable to attend the tasting. The dog days of summer just got cooler – Brooklyn Style. Steve’s Ice Cream and 61 Local host a Pint Mash Up Featuring: Three new ice cream flavors made with local craft beer: Beer Pretzel Caramel, Maple Porter Pecan and Brooklyn Blackout. Stop by for beer, artisanal soda, coffee and kombucha floats paired with Steve’s unique ice cream flavors. Buy one and win a chance at gift baskets choc-full-o local goodness like Cut Brooklyn, Mike’s Hot Honey, Liddabit Sweets, Brooklyn Butcher Block and KBBK Kombucha. Get a second straw to share your float with your favorite vendor. They’ll be in the house! Don’t miss a “pint” shuffleboard competition for the ages pitting the ultra competitive pro-brewers of Sixpoint Craft Ales and Barrier Brewing Co against the lovable and affable Brooklyn Home Brew Crew. The prize is a multilayered ice cream trophy cake by Ovenly featuring the three new Steve’s flavors. Come and get a piece by cheering on your favorite team. 11p.m. : Winners of the raffle prizes are announced. 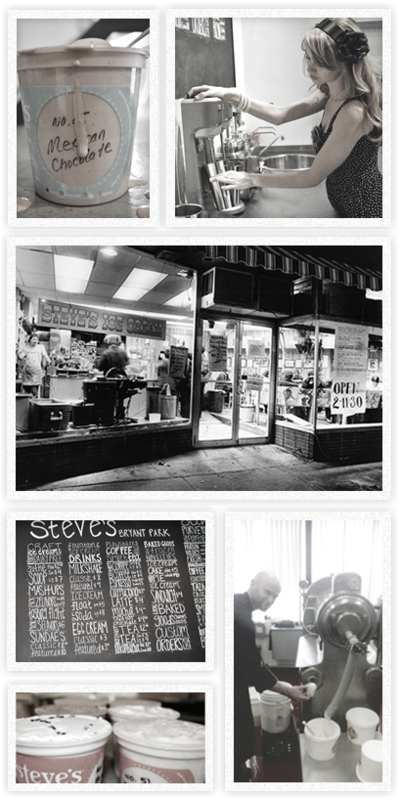 We’re talking Steve’s ice cream pints, Liddabit Sweets, Oslo coffee beans, a knife skills class from Cut Brooklyn, a hand crafted cutting board from Brooklyn Butcher Block and much, much more! “Pint” shuffle showdown between those lovable underdogs the Home Brewers and the ruthless Sixpoint and Barrier Brewing pro-team. Brooklyn Cured is excited to announce that its next Sausage-Making Class. Brooklyn Cured’s goal is to have a sausage on every grill this season. You could help them accomplish that goal by making your very own sausages with their instruction. They’ll be sharing their secrets to making well-seasoned, perfectly textured sausages with distinct flavors. Brooklyn Cured founder Scott Bridi will teach the class. Students in the class will get hands-on practice, you’ll even get to take home some of the fruits of our labor. As an added bonus, 61 Local is pairing 3 different artisanal beers to compliment their sausages. 61 Local is a new public house that is committed to serving the best locally crafted food and drink around. 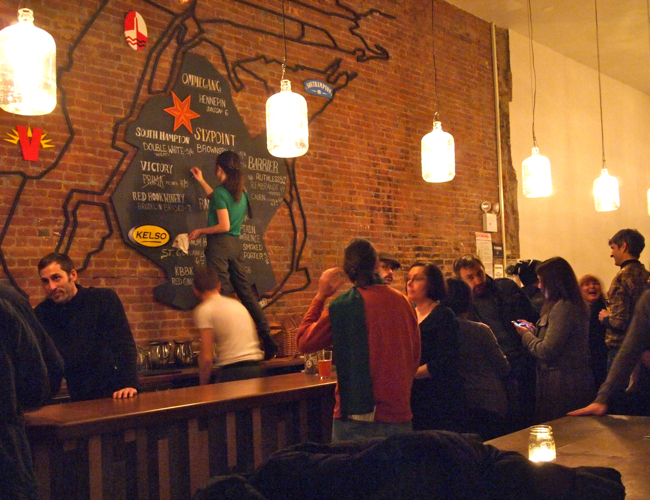 They feature local producers such as Sixpoint Craft Ales and Red Hook Winery and they have Kombucha Brooklyn in tap. Mon. to Thurs: 11 a.m. to 12 a.m.
Fri and Sat: 11 a.m. to 1 a.m.
Sun: 11 a.m. to 12a.m.